How do trade show giveaways boost brand recognition for businesses and organizations using spinning prize wheel displays to create excitement around a cause or product? Morale-boosting games of chance are unique in their ability to generate enthusiasm at conventions, sales meetings, fundraisers, church picnics, and team-oriented events. Branded trade show giveaways, like corporate gifts and contest freebies, reward winners with fun and functional products that say “thanks for playing.” Supplies complement prize drop games and raffle drums, too. Cheap trade show giveaways, also known as promotional products, should project high quality without breaking the company budget. Our versatile line of corporate gifts for write-on tabletop prize wheels represents eco-friendly and budget conscious values that impress customers. Maximum brand exposure is the result of giving away high-impact trade show giveaways. The most effective marketing plans are balanced on this winning formula: low price point, high quality - which is exactly what these products exemplify. What types of bulk corporate gifts go with the prize wheels and drops, and raffle drums? This group of cheap trade show giveaways includes anti-bacterial hand sanitizers with fliptop design. Great for hospital fundraisers, church events, and children’s causes, travel-worthy carabiners come with an attachment clip. At just 1.8 ounces, sanitizers with custom imprint fit right in a purse, pocket, or backpack. 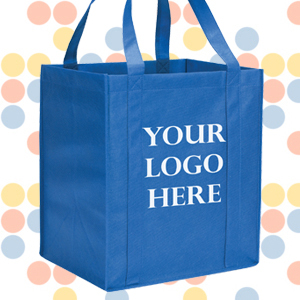 Reusable custom printed tote bags with silk screen 1-color graphics for logos and taglines make great industry giveaways. Constructed of durable polypropylene with reinforced handles, eco-conscious accessories are perfect for school fundraisers and convention handouts. Use totes to haul groceries, gym clothes, school supplies, etc. Available in red, blue, or black. Eastman Tritan BPA-free shatterproof promotional drinkware comes in vibrant colors, and resists stains and odors. With a contrasting screw-on cap, these insulated custom tumbler cups are double-walled and include a stopper; hands stay dry, and drinks stay cold. Great for off-site business meetings! Logo pens with a 1-color custom imprint are an inexpensive way to get the news around about a fundraiser or brand. Writing tools are easy-gliding, smooth writing, and retractable for convenience - no lost caps! A side clip attaches the retractable pen to a lapel or pocket to keep hands free for other tasks. Designed to complement traditional branded literature, spinners, and personalized marketing materials, our selection of promo items ranging from the smallest rectractable pen, to large, eco-friendly reusable brand-logo totes. To make event planning easy, we've gathered an economical variety prizes on the market to complement our popular free standing prize wheels with printable templates. Presenting cheap, high quality promotional items with a clear company logo or tagline to contest winners makes a great impression. In addition, rewarding prospective customers who visit your booth with cool prizes encourages them to do business with you (or donate to a cause) later. Silkscreened contact information provides “free” indirect advertising every time a satisfied customer walks away with these affordable trade show giveaways. Chosen with economy as well as functionality in mind, every giveaway option comes with 1-color silkscreen printing. Available here alongside these prize and drop wheels, and raffle drums, are ballpoint pens, hand sanitizer clips, reusable custom tumbler cups, water bottles and tote bags. Whether used as in-office freebies or special imprinted tradeshow gifts, printed promotional products from this one-stop shop are an excellent and convenient way to get the word out.